This week's EKOS poll shows Liberals, Conservatives and the Bloc all dropping slightly to the profit of the Greens. The two big news from the regional breakdown are the Tories leading the Liberals by 2.5% in Ontario, but trailing them by 0.2% in BC. Apart from this and the NDP getting a very weak 14.2% in MB/SK, nothing out of the ordinary. The Tory national average lead is now 5%. Angus Reid has released its most recent poll, and nationally, it mirrors the recent EKOS and Ipsos polls in terms of the Conservative-Liberal gap. The main ways in which this poll differs from others are that the Liberals have lost their lead in Atlantic Canada (beware the small sample though! ), the Tories are strong in BC (40%, similar as in the Ipsos, but higher than all other March polls), and the NDP polled well across the country (except in the Prairies), scoring 20%. The 40-seat mark sets a new high for the NDP since this website was created! Their national poll average is now near their 2008 election result, which enables them to keep all 37 of their seats even though the Liberals are up slightly (but 4 of those are very close). The NDP gets 3 extra seats out West from Conservatives weakness. The polling average now has the Tories ahead by 4.8% on the Grits. This is mainly a reflection of Liberal weakness rather than Conservative strength: compared to March 2 when the gap was just over 3%, the CPC has gained no seats while the LPC has lost 6. This week's EKOS is out, and it has some very bad news for the Liberals. First, for the first time this year in an EKOS poll, the Tories lead in Ontario, albeit by a statistically insignificant 1.6%. Second, the 20.9% in Québec is very weak: down from 27.4% two weeks ago and 24.2% last week. All three other major parties gain slightly, but there is not much else to report - though it's kind of weird that the Tories now hold a clear national lead with just 33.3% support. This is the NDP's highest point in over 2 months. The Tories' national poll average lead is now 4.2%. Riding By Riding has posted a discussion about the growth of the House of Commons under rules proposed by the Harper government, and concludes that they would make Parliament add 20 seats every decade (after an initial 36-seat increase). That's a lot more than the roughly 7-seat decennial increase under current law, and in my opinion a bit too much - the House would have almost 400 seats in less than 25 years! Below, I propose a middle ground solution. 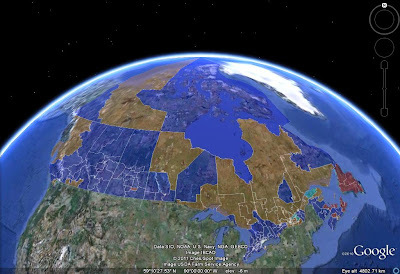 To fix ideas, currently, all provinces except ON, AB and BC are overrepresented. Their populations also tend to grow more slowly than the national population. Therefore, their number of seats should not increase. Under neither current rules nor the Conservative proposal would their seats decrease, and I don't see any political will to make those provinces swallow the pill of losing seats. Thus, any feasible redistribution scheme would freeze the number of seats in all provinces but ON, AB and BC, and my proposal is no exception. Under current rules, ON, AB and BC's number of seats is simply their share of the 10-province population multiplied by 279, rounded to the nearest integer (as is everything below). Under the Conservative proposal, it would be their "share" of Québec's population (i.e. 160% if they have 60% more people than Québec) times 75 (Québec's number of seats). Under my proposal, we would first determine the House's size so that Québec's 75-seat representation is proportional (i.e. the House size is to 75 what Canada's population is to Québec's). Then ON, AB and BC would divvy up the House less 138 seats (number of seats held by other provinces and the territories) proportionally to their population. None of these approaches is obviously better than the others. Current law basically assumes a 282-seat House, but gives out extra seats so that no province loses any. The Tory proposal ensures equality between the 4 largest provinces, who would be equally underrepresented. My proposal ensures that Québec, as a nation recognized by the House, is proportionally represented, while AB, BC and ON are less underrepresented than under current rules, but more so than under the Tory proposal. - Just like the Tory idea, it reduces AB, BC and ON's underrepresentation relative to current rules. - It does not grow the House as quickly as the Conservative proposal. For example, using Statistics Canada's October 2009 population estimates, the Tory plan would result in a 341-seat House (+33), while mine would create a 323-seat House (+15). (In case you're wondering, under current rules, it'd be 314 seats.) Down the road, extrapolating the population growth rates of Québec and Canada from 2005-2009, the House would expand by 3-4% per decade, or around 10 seats, which is quite reasonable. - It should be acceptable to the Bloc and Quebecers in general: yes, Québec would go from being overrepresented to proportionally represented, but it'd be hard to argue that the latter is unfair. Under the Tory proposal, Québec is singled out as the only currently overrepresented province to become underrepresented. Thus, my proposal is roughly 2/3 current law and 1/3 Tory proposal. Ipsos-Reid has released a new poll (hat tip to ThreeHundredEight.com) showing the Conservatives leading by 6 points. This is more than what other pollsters show, but less than the 8-point gap in last month's Ipsos poll, so the news isn't as good for the Tories as the headline suggests. In fact, the regional breakdown shows that Tory strength in this poll comes from Alberta and BC, two areas where they weren't projected to lose any seats narrowly. Their 20% in Québec is good news, but the dismal 21% in Atlantic Canada and the strong 29% for the NDP in MB/SK offset it. The NDP also posted an excellent 32% in Atlantic Canada and 18% nationally, so this is a good poll for them. As for the Liberals, the gloomy headline figure reflects their weakness in the West; they actually got a nice 27% in Québec and maintain their lead in Ontario, so this poll is not bad news in terms of seats. Indeed, the aggregate projection actually has the Tories losing a seat, while the Liberals and the NDP gain. The Bloc shows a rather large drop, but those seats are all marginal. The national Tory average lead did tick up to 3.4%. If you think we have a crappy federal government with no good alternatives, look at Québec and rejoice! The Charest government has been refusing to hold a public inquiry on the corrupt construction sector, whose firms and unions have infiltrated virtually all spheres of public decision-making, or so it seems. Meanwhile, the healthcare system is once again in crisis - almost 7 years after the Québec Liberals were elected to fix it, and, much like in Ottawa, there is no credible plan to erase the deficit. The federal Tories might be just as limp and complacent (and much more gimmicky and juvenile), but at least they don't face any crisis nearly as important as the healthcare or construction ones in Québec. - saying right-wing (for Québec) sounding things (e.g. the PQ will now focus on wealth creation through the individual) while proposing the same old big government programs. The federal Liberals might not have a concrete plan for a liberal Canada, but the PQ, after deciding that it will not ask for a referendum for the foreseeable future, doesn't even know what kind of Québec it wants; as a result, the PQ is trying to be a populist progressive individualist socialist party. So in Ottawa, we have a vaguely centre-right party and a vaguely centre-left party. Neither of them has a crisp plan, but you can kind of see the direction in which the country would move - at an excruciatingly slow pace - under either of them. In Quebec City, it's worse: literally a party that stands for nothing versus a party that stands for everything - a choice between complete paralysis and a random direction. Still, 99% of Quebecers (and I include myself in the bunch) are perfectly happy now, due to the Habs' 6-game winning streak! This week's EKOS poll shows some small favourable movement toward the Tories: there is now a Liberal-Conservative tie in Atlantic Canada and, more significantly, Ontario. 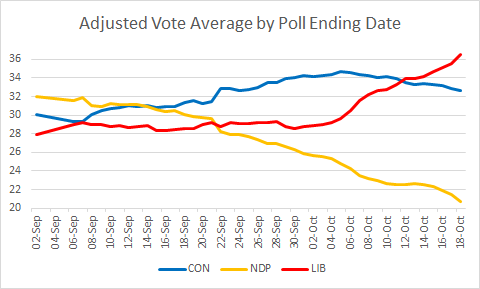 It's not all good news for the Tories though: they now only lead MB/SK by 13.6 over the Liberals (compared to 34.1 in the last election), and they're only at 32% in BC, down 4.4% from last week's EKOS. This is a bad poll for the Liberals: lost their edge in Atlantic Canada and Ontario, and an average result in Québec dashes some of the enthusiasm they may have felt after last week's good EKOS and this week's excellent Nanos results there. Does this mean we can doze off until May? Tories lead the national weighted average by just over 3%. A new Nanos poll shows a national tie between the Tories and the Liberals. The Grits score a high 42% in Atlantic Canada and in Ontario, and are only 0.5% behind the Bloc in Québec. The Tories manage a respectable 39% in Ontario and 22% in Québec. The NDP have a nice 17.8% nationally, but weak Ontario (14.6%) and BC (23.1%) numbers are cause for concern (although it should be noted that the Ontario result is still up from the dismal 10.9% in the previous Nanos poll). A Léger poll in Québec is consistent with recent results from other polls: Bloc up 12 on Liberals and 20 on Tories. Including the Léger poll had no effect on the Québec projection, while including the Nanos poll nets 4 seats for the Liberals - 2 from the Bloc, and 2 from the NDP in Ontario. The Tory national weighted-average lead is just under 3%. - Liberals score a respectable 27.4% in Québec, after several disappointing polls there. This stops their downward trend in that province - for now. - The NDP get 17.9% in Ontario, a 3.6% gain, while the Liberals and Tories both lose some support. 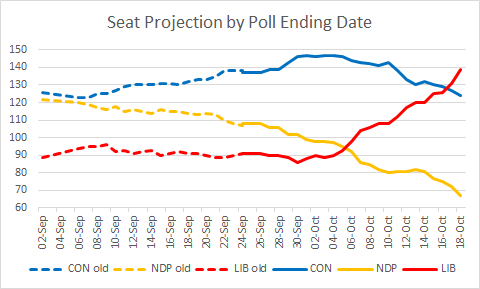 None of these changes are statistically significant, but they produce the only change in the seat projection: 2 go from the Liberals to the NDP. This swing wouldn't have occurred, however, without Angus Reid's poll from last week (accounting for 14% of my polling averages), which had the Liberals at a low 33% and the NDP at a very high 22% in Ontario. - Tories now have a 15% lead over both the Grits and the NDP in BC. This is a drastic reversal from last week's EKOS, which showed a virtual 3-way tie. Note also that while the Harris-Decima poll from last week showed a virtual Con-Lib tie, this week's Harris-Decima poll has a 14-point Tory lead. Statistical coincidence, temporary Tory bump, or new trend in BC? The Liberals are now about half way between their early December lows and their early February highs in terms of seats, even though their popular support gap with the Tories (3.4%) is much closer to the February levels than the December levels. The upshot is that if the numbers keep deteriorating for the Liberals, they'd lose seats at a slow rate, while if the numbers turn back up, they'd gain seats pretty quickly. This week's Harris-Decima poll has results in line with recent polling averages everywhere in the country, except for a very strong 44% for the Bloc in Québec. Surprising results from last week's Harris-Decima, i.e. the 20-point Liberal lead in Atlantic Canada and the virtual Grit/Tory tie in BC, were replaced by more "normal" numbers (Liberal edge in the Atlantic, Tory lead in BC). The Ontario numbers remain essentially unchanged. The national Conservative lead is 3.5%. Harris-Decima has finally posted the regional breakdown of their poll. The favourable headline figures for the Liberals are due to results in two regions: Atlantic Canada, where this poll has the Liberals up by 15 over the NDP and by 20 over the Tories, and BC, where this poll sides with EKOS and Angus showing a tight race (rather than with Ipsos and Environics, which show a large Tory lead). The Tory national polling average lead is down to 2.8%. This week's EKOS is out, and none of the regional numbers are out of line with recent averages of other polls, except perhaps the low NDP number in Alberta (5.2%, less than half the Greens' 13%), and the low Tory number in BC (28.5%, fractionally less than the Liberals' 28.7%). The poll average has the Tories with a 3.3-point national lead, excluding this week's Harris-Decima poll, for which no regional breakdown was released, and which showed a dead heat. The projection would probably be somewhat more favourable to the Liberals were I able to incorporate that poll. Angus Reid came out with a strong poll for the NDP yesterday, putting them at 20% nationally. However, while the Ontario NDP number was very strong at 22%, their BC number lagged the Liberals by 8% (25 vs. 33). The good news for the Tories in the poll are that they're essentially tied with the Grits in Ontario, and back up to a decent 19% in Québec. The bad news is that they're tied with the Liberals in BC. National and Québec numbers for a Harris-Decima poll were also released yesterday (Libs and Tories tied at 31 nationally), but no regional breakdown is available. If the breakdown doesn't come out by the time I do the EKOS update tomorrow, then I'll just treat the Harris-Decima poll as a regional Québec poll. Venues: Things were pretty nice overall, but there was no exclamation point, so I start with a B. However, having competitions at Cypress Mountain turned out to be too audacious. Also, the ice track in Whistler should obviously have been safer. Still, the Georgian luger's death cannot be solely blamed on the organizers (the luge federation, track designer and luger himself must share responsibility), so I won't knock the grade down too much. C.
Security: Media from all over the world marveled at the non-intrusiveness and efficiency of the security apparatus. A. Logistics: A few transportation glitches here and there (especially with buses early on), and a few minor ticketing issues, but nothing out of line with other Olympics. No significant technical problems with broadcasting (just a few occasional problems with timers). Good, but not great, website. B.
Non-sporting Organization: Slight lack of French at the opening ceremony, but adequate representation at the closing one, and great presence during the Games. Incredibly stupid arrangement for the Olympic Cauldron, but adequate fix found, with closer access to the flame than ever before. Embarrassing glitch at the opening ceremony, but brilliant recovery at the closing one. Up to now, not great, but OK. I cringed at the response to Nodar Kumaritashvili's death. Suppose your clumsy friend Ronald falls on a knife and kills himself while helping you cook for a party, and his family inquires about what happened. Other people present are already telling the family that it's indeed your friend's maladroitness. What would you say? "I'm terribly sorry for your loss." or "I'm terribly sorry for your loss, but this was entirely Ronald's fault, and I reject any responsibility." VANOC opted for the latter. Perhaps it was for legal reasons, but couldn't VANOC have let the RCMP and Luge Federation do the talking about the investigation? Also, publicly congratulating yourself that, after several days, you finally found a partial solution to a problem arising from an inexplicable brain cramp (the fence around the cauldron), is rather rich. Something like, "This is what we're doing. We're glad to have solved the problem, but regret that it was there in the first place. We hope that the public will like it" would have been much more appropriate (and Canadian) than "Aren't we great? We managed to move the fence, make a cutout, and allow people to go up an adjacent building in a matter of just a few days! This shows how adaptable and flexible we are." A stuffed nose could smell the insecurity from St. John's. It wasn't just VANOC: Mayor Robertson also said in the middle of the first week, when all the glitches were going on and not yet resolved, that these were the best organized games ever. Ha! Try saying that with a straight face - especially at that point - to an organizer from Beijing, Salt Lake City, Sydney or Nagano. This type of childlike defensive attitude reflected poorly upon Canada, and unfortunately cast a shadow over VANOC's and Vancouver's legitimate achievements. This explains the feeling in the international media that while Canadian organizers did a good job and met high expectations, they also appeared to be some of the most arrogant, graceless and thin-skinned people in the world. B for performance, F for optics. Given that actual performance is still more important, I'll average these out to a C.
Sporting Organization: The ice resurfacing problems at the Oval were ridiculous. So even if everything else under VANOC's control (i.e. not counting the weather and the biathlon pursuit starting snafus, which were entirely under the control of the biathlon federation) went right, it deserves no more than a C.
Atmosphere: The Sydney Morning Herald said that Vancouver embraced the Games more than Sydney did. That's the best Vancouver could possibly have hoped for - no big city can match Lillehammer's magical ambiance. Given that Winter Olympics will probably be held in big cities from now on, no Games is likely to be as fun as Vancouver's for decades to come. Will the city carry this energy and shed its 'No Fun' label? A+. Overall: 1 A+, 1 A, 1 B, 3 C's. The average is just below a B. The atmosphere, though, is probably the most important of these ratings, so I'll go with a solid B: above average. Canada and Vancouver did a good job. But despite what Stephen Harper says, we were not quite as good as Lillehammer (who can ever beat that? ), and only matched Sydney in the 2nd week. That said, overall, we at least equaled, if not slightly topped, the better recent Games (Nagano, Salt Lake and Beijing, especially if you don't count the latter's ceremonies), all of which were a bit stronger organizationally, but not nearly as fun. And we were clearly better than the weaker ones (Atlanta, Athens, Turin). So good job VANOC, Vancouver and Canada! But let's not congratulate ourselves too hard, so that we can remember to draw the lessons that we should. Tories lead by more than 3 in the national poll average. I can't resist a quick post about the Olympics! Much has been said about the US setting a new Winter Olympics medal record (37), and Canada setting a new Winter Olympics gold medal record (14). But what would the medal count look like if we weighted each medal according to some measure of significance? Freestyle and snowboard appear overweighted at first glance. But I would argue that each of these "sports" is actually 3 sports: for example, ski cross and aerials are just as far apart as alpine skiing and cross-country, and more so than the two kinds of speedskating. The total weight for the 86 events is 137 (69 for ice sports and 68 for snow sports), so I then multiply by 86/137 and round to the nearest integer to produce the adjusted medal count. Canada and Finland are the big winners. The US gains as well, while all other countries lose out, but only slightly. O Canada! Even if I had weighted the hockey and curling medals at 2 instead of 7 and 4, Canada's normalized gold total would still be 18. That's right - not only did Canada win the most medals ever, but it tended to win them in team events and in events where athletes did not have multiple chances. The latter means that to get to 14, Canada couldn't rely on a handful of sports that happen to have lots of events: amazingly, despite the huge overall total, Canada did not win more than 2 gold medals in any sport, and no Canadian athlete got more than 2 medals of any colour. Canada is also the only country to have won gold in a majority of the 15 sports (9). So, in summary: once you apply some kind of sensible weighting scheme to events, the Canadian performance at the Games is even more impressive!